While Jim was over at Nicola’s yesterday afternoon (Tuesday 18th May 2010) doing some bits and pieces to do with the Whisky Boys it was decided that we would open the bottle of Dimple just to cheer us up and break the afternoon. So Nicola went off and got a couple of tasting glasses and a jug of water. Sitting around Nicola’s dinning room table the bottle was opened. This De Luxe Blend is one of the Diageo Family. 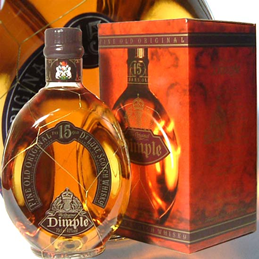 Dimples family home is Glenkinchie Distillery near Edinburgh with an input from some northern Distilleries. This bottle was picked up during our Glenkinchie Whisky – Distillery Visit. Nose…Fragrant almost tones of perfume mellowing to a sweet buttery aroma. Taste…Flavoursome and light, nothing spicy or harsh here. Finish…Short, nothing left after a second or two. Nose…No one aroma is in charge here, a little complex. Taste…Smooth and mellow, some lightly rich flavours, barley/malt with ever so slight smoke hint. Finish…Short finish and maybe a gesture of dark chocolate hiding in there. That was quite pleasant not overpowering with flavour but could be a very nice dram to come home to after a hard days work prior to your evening meal, but after dinner you would probably pick a more flavoursome dram, maybe a single malt. 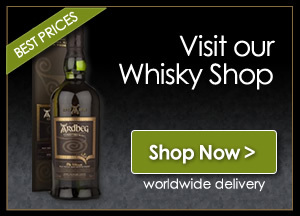 This dram is quite easy to come by as many of the high street supermarkets have this on their shelves. The Whisky Boys have a few De Luxe blends in their cabinet (check out our Whisky Shelf ) with some a touch better than this Dimple, but this is a dram to always have in your cabinet as the bottle is world known and shows a bit of class when you offer someone a dram from this unique bottle. Hi i dont know if you can help at all i have a Dimple bottle of scotch that i bought in 1971 for £7 in a gold presentation box it is all sealed and complete ,is it worth anything ? obviously not a scotch drinker.